Few are my experience in barolo & barbaresco. I was (un? )lucky enough to start with a great flight of top barolos. They impressed me so much that I thought I will never ever really get back to their everday, lesser ones. I also had a few glimpse of the highly tannic young talents, and they did a good job of hiding their treasures from me. Last year I bought a cheap barolo in an Autogrill on the Tuscan motorway, just for fun. And this cheap barolo did provide enjoyment due to its tipicity & good drinkability. So it was pretty straightforward what to do, when I noticed a whole set of very reasonably priced barolos & barbarescos in the Austrian discount chain Merkur. I bought a full set of the Terre del Barolo Cooperative products between 12-16 EUR, and started drinking. Mid garnet hue, garnet brim. A beautiful, uncomplicated, very much nebbiolo-like nose, cherry, tar, sweet spice, mostly fruit, and very much varietal. The same on the palate, dominated by sour cherry and a touch of spice, mid-level tannins get a firm, but very gentle grip on the palate. A really nice experience for a beginner like me on the nebbiolo scene. Varietal, enjoyable, recognizable, and equally useful for an evening chatter or a good meal. Whao. I might need a bit more of that. 84 points. No faults, with some recognizable values, and a bit of fascination. I bought this wine at the Austrian supermarket chain Merkur as a budget wine for ca. 15 EUR. And I am satisfied. Also, we had a Barbaresco Riserva 2006 a week before. It was OK at around 82 points, but failed to impress for 12 EUR, what is a really entry level price for barbaresco. I still have a higher positioned Barolo called ‘La Terre’, and also a Decanter World Wine Award bronze medalist Barbaresco. I am looking forward to them. 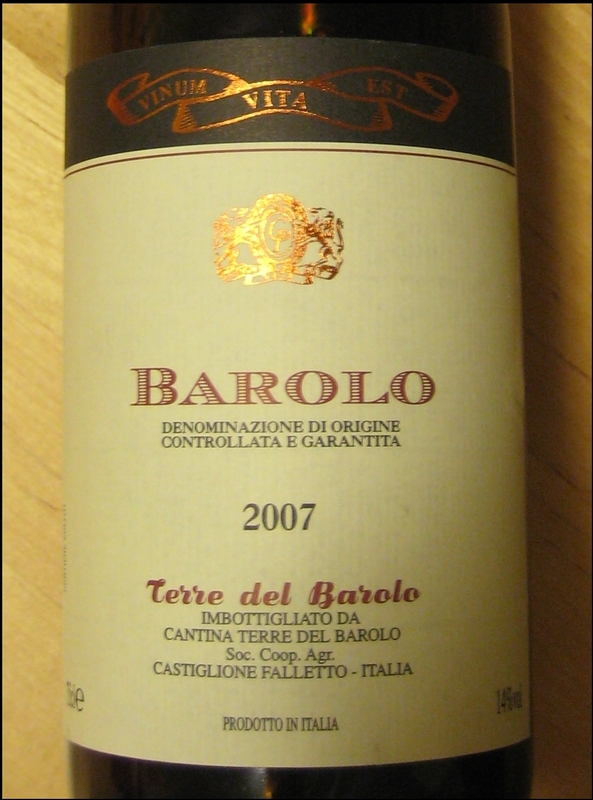 This entry was posted in Red Wines and tagged 2007, barolo, nebbiolo, piedmont. Bookmark the permalink.